Chrysler Museum of Art, Norfolk, VA, Gift of Walter P. Chrysler, Jr. 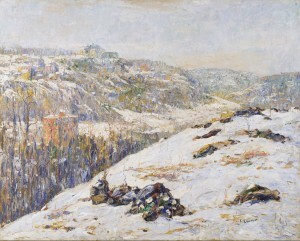 The viewer is placed high on a hillside looking down on Northern Manhattan, which appears almost bucolic in its covering of cool winter light and snow. Lawson’s upper Manhattan neighborhood and its surroundings was his favorite and most frequent subject. Lawson is usually labeled an Impressionist due to his interest in light and atmosphere, his loose brushwork, and his early training with John Henry Twachtman and J. Alden Weir. But he is also linked with the Ashcan School, the Realist art movement that was prominent in New York in the early twentieth century for portraying the grittier side of city life. He exhibited with both groups, following his conviction that an artist must be true to his own individuality. Lawson was a founding member of the Association of American Painters and Sculptors and served on the Armory Show’s Committee on Foreign Exhibits. He lent three paintings to the exhibition, all landscapes. The price listed for the canvas was $800 in Walt Kuhn’s annotated exhibition catalogue, but $1,200 in Elmer MacRae’s. The lower price is probably correct, for the painting sold for $660 to Charles M. Lincoln on February 26, 1913. See Milton Brown, The Story of the Armory Show, 2nd ed. (New York: Abbeville Press, 1988), 285. The Canadian-born American Impressionist painter Ernest Lawson studied at the Art Students League in New York from 1891 and 1892, and took summer classes under J. Alden Weir and John Henry Twachtman in Cos Cob, Connecticut. From 1893 to 1896 he was in Paris, where he studied briefly at the Académie Julian, met the Impressionist painter Alfred Sisley, confirmed his commitment to plein-air painting, and exhibited two paintings in the Paris Salon in 1894. Back in New York Lawson settled in upper Manhattan, where he painted the city and its surrounding landscape in changing conditions of light and weather in an Impressionist style notable for its thick impasto and strong lines. When Lawson’s work was rejected from the National Academy of Design in 1905 he joined The Eight, a group of American artists who were committed to challenging the dominance of the conservative Academy. In 1910 he participated in the Independent Artists exhibition in New York, and in 1913 he was invited to exhibit at the Armory Show. Though he achieved success as a painter, winning numerous awards including gold medals at the Pennsylvania Academy of Art in 1907 and at the Panama Pacific Exhibition in 1915, bouts of alcoholism and financial troubles wrecked his career. He spent the 1920s teaching art in Kansas City and Colorado Springs. In 1936 he moved to Florida, where he died of an apparent heart attack in 1939. See Valerie Ann Leeds, Ernest Lawson, exh. cat. (New York: Gerald Peters Gallery, 2000); and Guy Pène du Bois, Ernest Lawson (New York: American Artists Series, 1932). See Elizabeth Kennedy, ed., The Eight and American Modernisms, exh. cat. (New Britain, Conn.: New Britain Museum of American Art, 2006).